Christopher Lao is trending on Twitter because of his “floating car” video. Christopher Lao became famous after GMA-7 reported about his “floating” car. The video uploaded on YouTube was first aired on 24 Oras last Tuesday night. 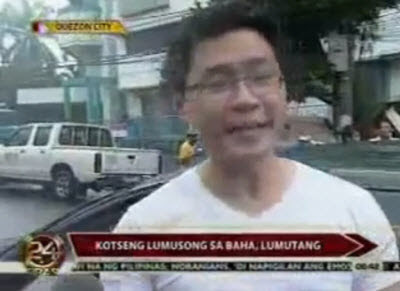 It’s a news report about Lao, a UP College of Law student, who braced his car to the deep flood waters in Quezon City. The incident was caught on camera by GMA-7 reporter Jun Veneracion. In the 24 Oras interview, Lao blamed the MMDA and bystanders for not blocking the road and for not informing him that the flood was deep. The YouTube video of the said news report is now going viral as Christopher Lao is now trending on social networking sites such as Facebook and Twitter. The newly created “Christopher Lao (ang bobong sinugod ang kotse sa baha)” Facebook fan page already got 35,174 likes as of this posting.